Android is a mobile operating system currently developed by Google, based on the Linux kernel and designed primarily for touchscreen mobile devices such as smartphones and tablets. 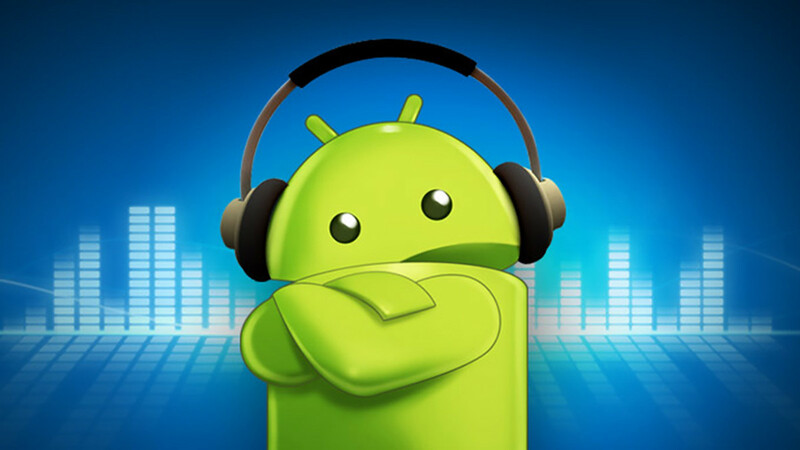 And as we said before, Android offers a unified approach to application development for mobile devices. Android is an open-source operating system named Android. 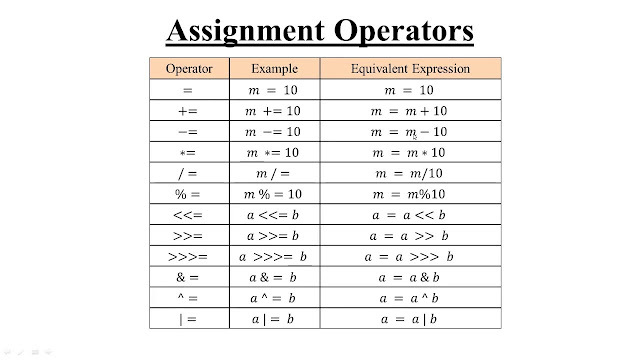 Google has made the code for all the low-level "stuff" as well as the needed middleware to power and use an electronic device, and gave Android freely to anyone who wants to write code and build the operating system from it. There is even a full application framework included, so third-party apps can be built and installed, then made available for the user to run as they like. 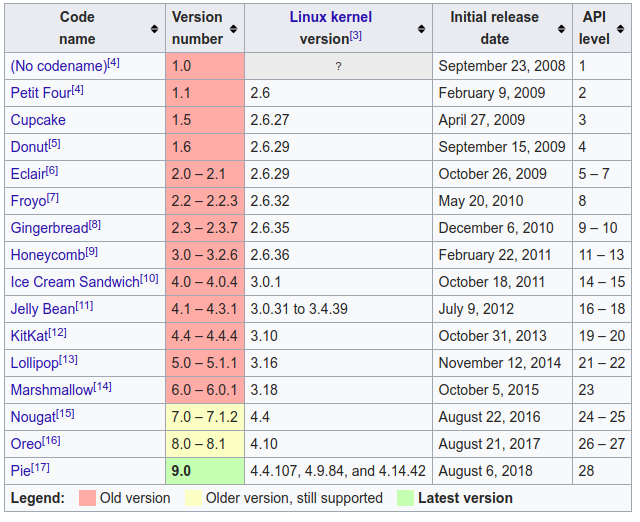 Android has the largest installed base of all operating systems of any kind. Android has been the best selling OS on tablets since 2013, and on smartphones it is dominant by any metric. 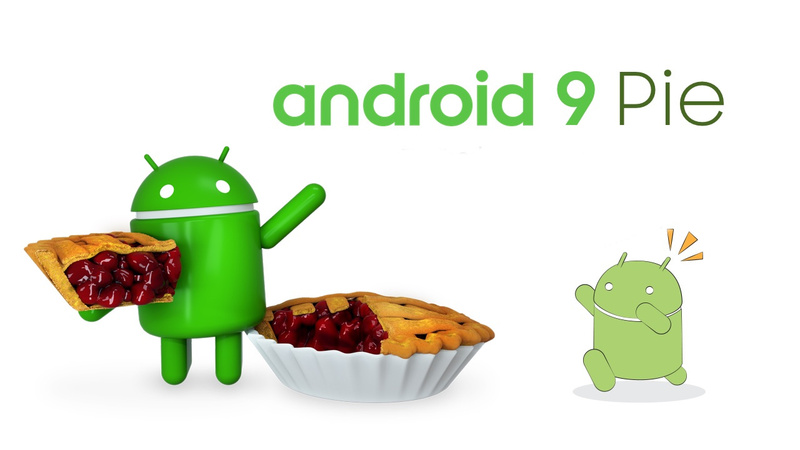 Android pie is latest version of Android. Android Studio is a popular IDE developed by Google for developing applications that are targeted at the Android platform. 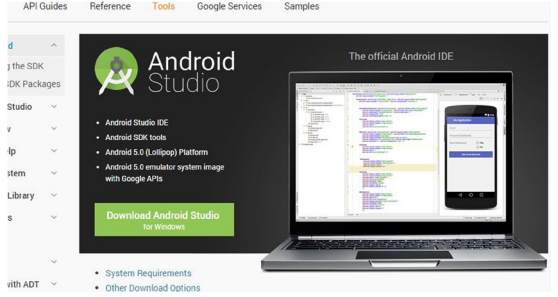 Note that Android Studio has replaced Eclipse as the IDE of choice for developing Android applications. 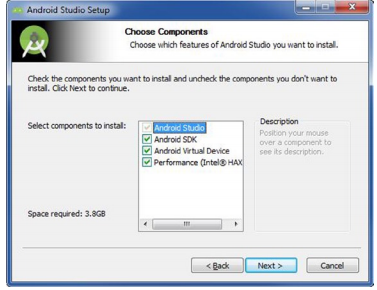 This article presents a discussion on how to get started using the Android Studio for developing Android applications. It’s an Android focused IDE, designed specially for the Android development. It was launched on 16th May 2013, during Google I/O 2013 annual event. 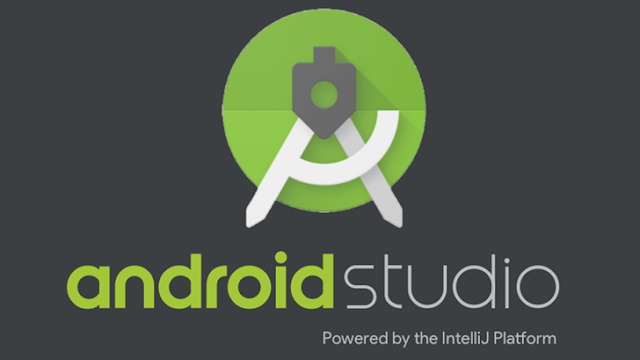 Android studio contains all the Android sDK tools to design, test, debug and profile your app. By looking at the development tools and environment, we can its similar to eclispe with the ADT plug-in but as I have mentioned above its android focused IDE, there are many cool features available in Android Studio which can foster and increase your development productivity. One great thing is that it depends on the IntelliJ Idea IDE which is proved itself a great IDE and has been using by most all the Android engineers. Android Studio is Google’s recommended environment for developing Android applications, and plenty of new features were announced at Google I/O. 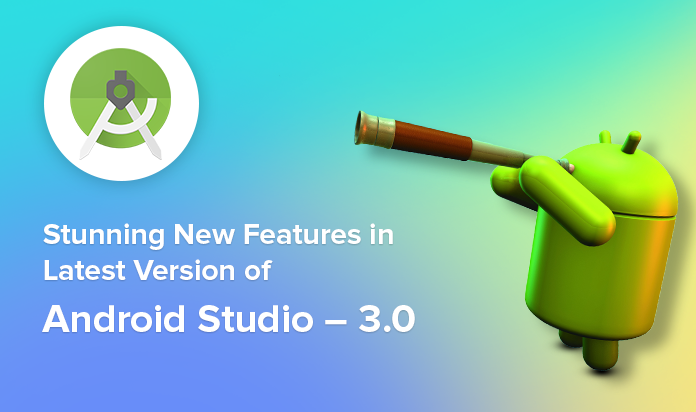 Some of those improvements have now landed in the beta branch, with the release of Android Studio 3.2 Beta. The main new feature in Android Studio 3.2 is the ability to generate App Bundles. Lint tool analysis (The Android lint tool is a static code analysis tool that checks your Android project source files for potential bugs and optimization improvements for correctness, security, performance, usability, accessibility, and internationalization.). Before you begin downloading Android Studio, create a labs parent directory for the labs you will create in this book. We use C:\androidBook\ as our labs’ parent directory throughout the book, but you may choose or create whatever directory you see fit. For that reason, we simply call it the labs parent directory. Now click the large green Download Android Studio for your OS button, Next, select the check box labeled I Have Read and Agree with the Above Terms and Conditions. Click Download Android Studio for your OS again, and your installation file should begin downloading. Once the download is complete, execute the file you just downloaded. After the Installation Wizard begins, move through its screens by clicking the Next buttons until you reach the Choose Components screen. There, select all the component check boxes. Then click Next. Agree to the terms and conditions once again. 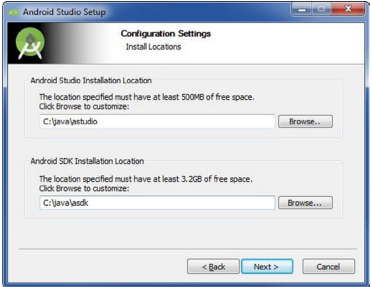 When you reach the Configuration Settings: Install Locations screen, select the locations for Android Studio and the Android SDK. To be consistent, we chose to install Android Studio in C:\Java\astudio\ and the Android SDK in C:\Java\asdk\. 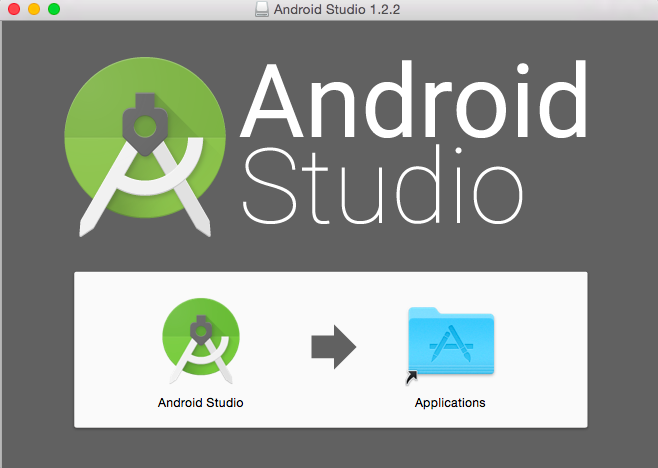 Click through several Next buttons as you install both Android Studio and the Android SDK. 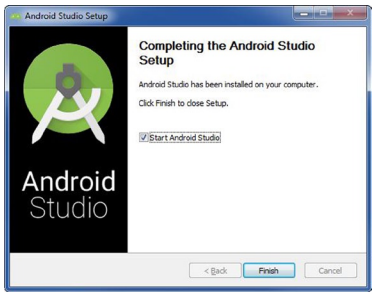 You should eventually arrive at the Completing the Android Studio Setup screen. The Start Android Studio check box enables Android Studio to launch after you click Finish. Make sure the check box is selected, and then go ahead and click Finish, and Android Studio will launch. Please note that from here on out, you will need to navigate to either the desktop icon or the Start menu to launch Android Studio. When Android Studio starts for the very first time, the Setup Wizard, will analyze your system looking for an existing JDK (such as the one you installed earlier), as well as the location of the Android SDK. 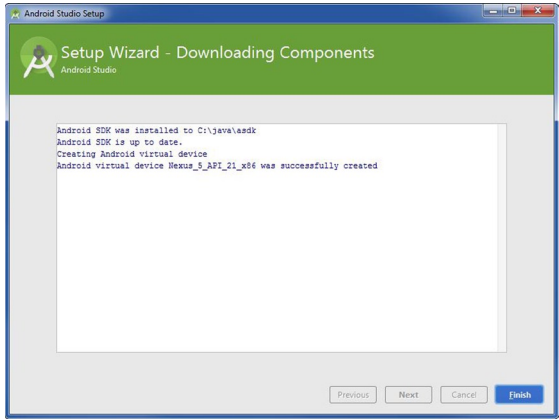 The Setup Wizard should download everything you need to begin developing apps in Android Studio. Click the Finish button to dismiss the Setup Wizard. Once Android Studio is up and running, you’ll want to dive in and create a new project. You can do this by launching Android Studio and then selecting New Project, or you can choose File > New > New Project at any time from the IDE itself. You’ll then have the opportunity to choose from a number of different types of activity. Activities are effectively ‘screens’ in an app. In some cases, this will be the entire app or in others, your app might transition from one screen to the next. You’re free to start a new project with no activity (in which case, you would choose ‘Add No Activity’) but you’ll almost always want one, so it’s easier to let Android Studio set you up with something resembling a blank app template to begin with. Often you’ll choose a ‘Basic Activity’, which is the default look and feel for a new Android App. This will include a menu in the top right corner, as well as a FAB button – Floating Action Button – which is a design choice that Google is trying to encourage. An ‘Empty Activity’ is the same thing but without the added chrome. Pick the option that best suits the app you have in mind to build and this will impact on the kind of files you are presented with when you first start things up. You’ll also be able to choose your app’s name at this point, the minimum Android SDK you want to support and the package name. The package name is the final file name that the app will have when you upload it to the Play Store – a combination of the app’s name, along with the name of the developer.